Netflix, a service that we have come to love over the past few years. It’s certainly a service that I use on a daily basis with it installed on my xBox, laptop, and also my phone. However it’s only in recent years it has really started to motor on. 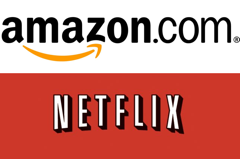 According to a book which goes by the name of Netflixed, Amazon made an attempt to buy the video streaming company Netflix in the 1990’s but were turned down due to the offer being too small for Netflix founder Reed Hastings, who went on to state that he was “less than impressed with Amazon’s $12 million offer”. Amazon themselves have predictably denied all knowledge of an offer ever being made to Netflix. I imagine the reason they are doing this is because they don’t want to be associated with a business deal that they lost, which turned out to be a billion dollar company. Of course Amazon now own the LoveFilm service as well their own video streaming service which is now available to premium Amazon customers, known as Amazon Prime. Which video streaming service do you currently use?